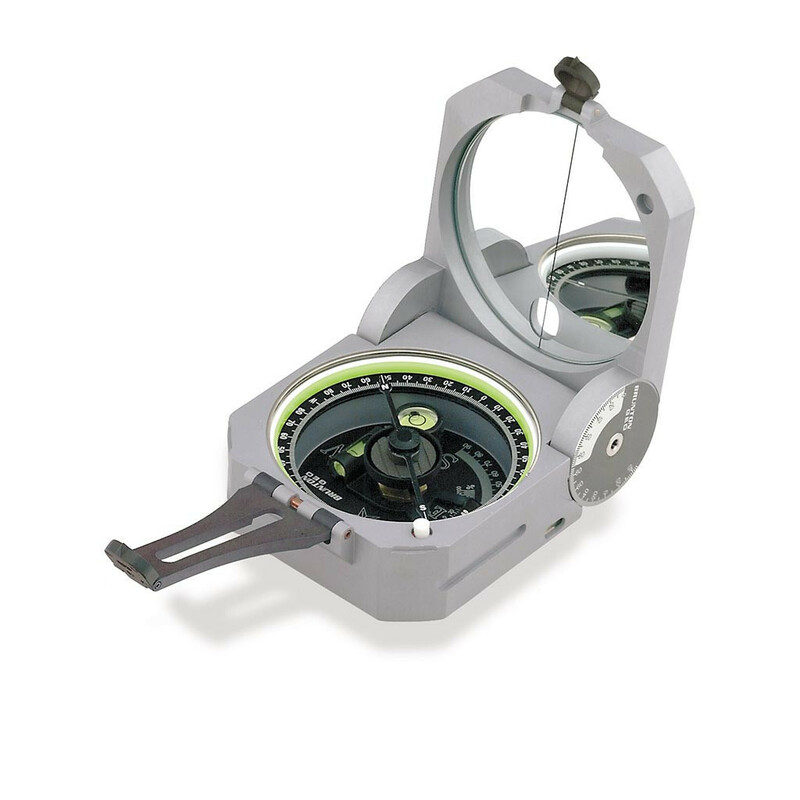 Brunton F-5010 Geo Pocket Transit is the most modern and sophisticated transit compass. It incorporates suggestions and ideas from professionals that have helped Brunton create the ultimate tool for use among a variety of industry professionals and hobbyists alike. Waterproof and comprised of high-quality aluminum, the Geo Pocket Transit contains a fast, magnetic north seeking, rare-earth magnet, balanced on a sapphire jewel bearing for fast measurements. Easily the most immediately noticeable feature is the hinge inclinometer, accurate to +/- 2°. This feature allows instantaneous and simultaneous trend and plunge measurements, reducing your workload required in the field to gather the same amount of measurements. An innovative needle design can be either unlocked or locked. This truly is the ultimate tool - those who own one cherish it. What is the accuracy of the Brunton Pocket Transit? The Brunton Pocket Transit displays 1 degree resolution. All Brunton Pocket Transits are built by hand and pass rigorous quality assurance inspections for 1/2° accuracy, both vertically and horizontally. How do I open my pocket transit? Simply rotate the pocket transit to face the flat cover side up. You also will want the small window positioned away from you. Then, simply unlatch the base from the over of the transit. How can I keep my pocket transit mirror protected? When not in use, Brunton recommends placing the pocket transit in the case with the base against the closing snap to protect it..
Why are E & W switched on the bottom plate? The Brunton Pocket Transit is a direct reading compass. The needle points directly to the bearing on the azimuth ring, which is graduated counter-clockwise. To obtain a direct reading, choose one of these two options: 1) Point the large sight toward the object, and read the bearing where the 'N' or white tip of the needle points to the azimuth ring, or 2) Point the small sight toward the object and read the bearing where the 'S' or black tip of the needle points to the azimuth ring. If the bearing of the object is 45 degrees from true north, for example, the needle will point exactly halfway between N and E on the bottom plate. The bearing will be the same using either method. Try it! Can I use a transit in different countries? Yes, you can. But keep in mind that your Pocket Transit requires special balancing If your location is near, or south of the balance lines contact ASD if you are uncertain or your transit requires special balancing. We would be happy to help you. What are some differences between the various models of Brunton's Pocket Transit? The Conventional/Commercial aluminum body is not waterproof, while the International aluminum body, the GEO billeted aluminum body, and the ComPro composite (plastic) body are waterproof. Both the Conventional and the International have the long bar, Alnico II magnet. The ComPro and GEO have a round NdFeB rare earth magnet which resists demagnetization better than the Alnico II magnet. The NdFeB magnet also settles slightly faster because the magnet is stronger. The International can be used in a wider range of countries because needle has a lower center of gravity, which reduces needle 'dip.' It is easier to read a bearing on the ComPro & GEO because of the way the north and south tip of the needle is marked (labeled 'N' & 'S' plus a line) for precise measurement. The International and the Conventional have a 'North' pointing needle which is solid white. The GEO incorporates two brand new features. It has a hinge inclinometer with accuracy to 2°. Now a user can sight dip and dip direction at the same time. Also, the hinge is much more durable and can withstand hard use. Brunton offers a lifetime warranty on the GEO, where all of the other Pocket Transits have a 1-year warranty. How can I protect my pocket transit mirror? To protect the mirror while in storage, Brunton recommends placing the pocket transit in the case with the base against the closing snap. Item arrived in brand new condition very quickly. Came with a very nice leather case. Ordered it late in the day around 2pm, and the item shipped out the same day getting to me in 2 days. I would highly recommend ASD. The Brunton Company warrants the GEO Transit to be free of defects in materials and workmanship for one year. This warranty is extended to the original purchaser only. The accompanying registration form must be filled out and received before this warranty will become valid. Should the product prove defective or need repair, contact Brunton for a Return Authorization Number (RA#). Loss is not covered by this warranty.